Knife Cold Steel G-10 Espada (Extra Large) XHP(62NGCX) High quality Cold Steel knives, throwing knives, tactical knives. Here at Cold Steel we've never been afraid to break with convention. For us function is always paramount. Our knives are made to work; and when it comes to knives, bigger is always better. That's why when everyone else in our industry was making the smallest, flimsiest, dainty little knives that they could, we released a series of blades that could only be classed as one thing - pocket swords! A design collaboration between celebrated custom knife maker Andrew Demko and Cold Steel President Lynn C. Thompson, the Espada series are a perfect amalgam of Demko’s engineering genius and Thompson’s vast knowledge of edged weapons and tools. Available in three sizes to suit the bold, the bolder and the boldest, these huge high performance folders are actually surprisingly easy to carry. Expertly designed to fit comfortably in your pocket, you’ll soon forget that you are carrying such a large and impressive blade. Built to snap into action in a flash thanks to our patented Demko Thumb Plate, the Espadas can be snagged on your pocket, actually opening the knife as you draw it – and bringing it in to play in the blink of an eye! The Espada's beautiful, flat ground, blades are made from premium American CTS XHP Alloy Steel. This USA powdered "super steel" was chosen for its ability to not only take a super-fine cutting edge, but to hold it for an exceptionally long time. Each knife is hand honed to a level of sharpness that is more at home on a surgeon's scalpel, creating a level of cutting performance that simply is astonishing. In order to protect your fingers from this wickedly sharp blade, each Espada is equipped with our patented Tri-Ad locking mechanism, proven to be the strongest lock in the world and virtually impervious to shock – making it almost impossible for the blade to close on your hand. In our own notoriously brutal product testing, the XL Espada was not only capable of easily holding 600lb of free hanging weight, but we even used it to support a hanging engine block! These incredibly popular, world renowned knives are available in two distinct configurations. Our classic Espada series, which gained even more popularity after its appearance the movie The Expendables (where it was carried and used by Mickey Rourke) features a rich satin polished blade, polished G10 scales and positively gleaming 7075 Aluminum bolsters and frame. 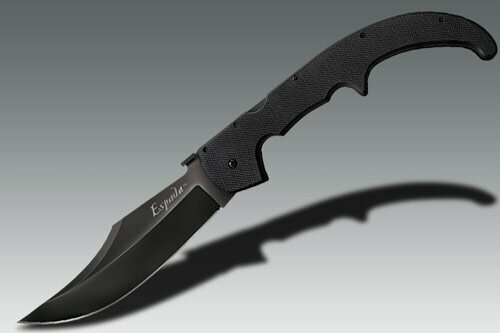 Alternatively, the Espada series is also available in a slightly more slim-line, tactical "blackout" edition, with a hard-wearing DLC coated blade and matte black American G10 handle scales. Whether you choose the elegance of the Medium model or the sheer majesty of our giant XL version, or any of the knives in between, you can be sure that Espada will be a talking point among your friends and loved ones for years to come.